We had a check up with the high-risk OB today (36 weeks, 2 days). 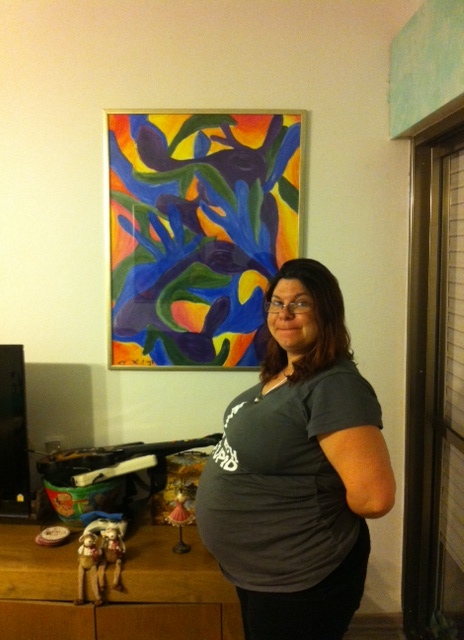 B5’s tummy is measuring about 10 days behind but her head is right on track. The doc didn’t seem concerned about it, so I’m not going to be either. She’s gained about 300 grams in two weeks, and is now estimated at around 2.5 kg. That’s about 5.5 pounds for you Americans. She also passed her NST with flying colors. 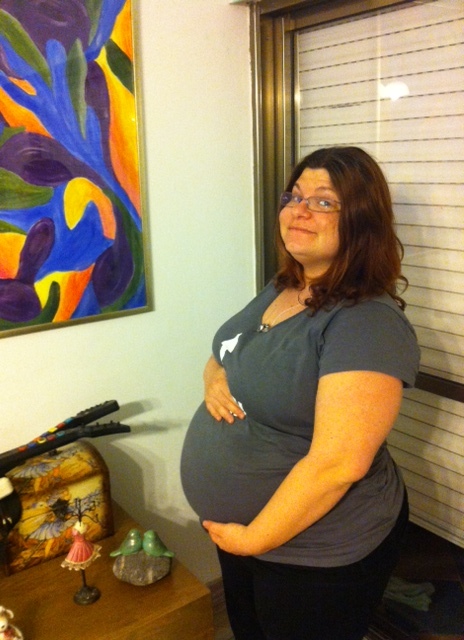 I got the official referral to Labor & Delivery to get the cerclage out, and that’s happening this Sunday or Monday. Yipes! There’s only about a 5% chance that removal of it will cause labor, but I’m packing the hospital bag this weekend just in case. I’m also trying not to get my hopes up. It’s still a little early, and she’ll come out when she’s good and ready. So they say. So I keep trying to tell myself. B5 is getting crowded in there. A couple of days ago she pulled some ninja moves that hurt like a mofo. I told her sternly that I’m very happy that she’s so active, but would she please just come out already so I can see the ninja moves rather than feel them? I seriously need this baby out already. I know we’re still kind of at the point where she’s most likely to do better inside then out, but the anxiety is killing me. I’m constantly obsessing, fretting, and worrying about what’s to come. I need her to be here, and be ok. I’m practically full term, that should be enough. I need to see her, living and breathing in front of me. Just so you understand how deep the crazy goes: The doc gives me the L&D referral to get the cerclage out. He says I could go anytime between now and whenever, really (which is actually encouraging and I guess means he’s fairly confident that she’s fully cooked). You don’t need to make an appointment for a cerclage removal here, you just go into L&D in the morning with a referral and they get ‘er done. So I talked it over with Shmerson and we decided Sunday or Monday, depending on what’s going on with his work. Then I looked at the referral again and noticed the words “good for 24 hours” on it (it’s an automatic thing with L&D referrals). And the referral has today’s date. So I go back into the doc’s office and point this out. He crosses out today’s date, puts in Sunday’s, and signs the paper where he changed it. I leave the clinic, and then spend the next HOUR AND A HALF literally obsessed with worry that L&D won’t admit me because of a bad referral. I mean what if I come in and they don’t approve of the handwritten change? What if that’s ok, but we come in Monday and the referral is dated Sunday? Will they count that as 24 hours or will the date change screw it up? I finally CALL the hospital, describe the referral in detail, tell them when I’m thinking of coming in, and check whether they will accept it. Of course they said they would. I spent an hour and a half worried sick about it. Honestly, I’m still a little worried about it. Even though I’ve been told explicitly that it’s ok. Moral of the story: I literally cannot fathom things actually going right. They have gone wrong for so long that it’s much easier for me to just think that they will continue to go wrong. Even when I am told “this isn’t a problem”, I’m still afraid it will be a problem. This is not a good way to live through these next couple of weeks. My head is not a fun place to be, I assure you. My belly button is in danger of becoming an outie. It’s getting very squished at this point. So Shmerson and I have given it a voice with which we dub it often, and decided that it is the perfect way to channel my feelings. An emoji emoticon has been chosen to properly represent the belly button’s constant sense of disdain toward the world. The Hebrew word for belly button is “poopik”. I have been texting Shmerson regular updates during the day on Poopik’s emotional state. “Poopik is worried”, “Poopik is bored”, and so forth. Today, Poopik has fluctuated between freaking out and proclaiming that “Poopik is not amused.” Which of course, it never is. It’s part of what makes Poopik Poopik. That last paragraph made me realize just how far gone I really am. Poopik concurs, in case you were curious. I leave you all with bunnies and a promise to update once the stitch is removed. Poopik has spoken. Poopik out! You look beautiful! Thanks for the bump pics and congrats on 36 weeks! Here’s to a happy and healthy B5!! I’m so excited to see the pictures of you…you look beautiful!! And yay for cerclage being out and go at anytime! I love that!! So happy for you! Mo, your bump picture is beautiful! Congrats on the 36 weeks! I’ll be praying for you on Sunday / Monday. . .and I totally understand your calling the hospital about the referral. I would do that! Home stretch and my fingers are crossed for you! So excited for you Mo! You, Shmerson, and B5 are gonna do great! I love the word Poopik and must include it in conversation as often as possible! Congrats on 36 weeks! You look great! You look so fantastic, Mo! You sound even better… Embracing what’s about to come! I would have obsessed over the referral too.. And would still be. I fret over everything! Oh my gosh! You are so close now. I know it feels like you have been pregnant forever and you want this little gal out, but try to enjoy as many moments as you can because lady, your world is going to be rocked. I know about the anxiety though and just wanting to see that lovely face. I am happy you took some bump pics. I love looking back at mine, even if I felt huge. I will pray that this stitch removal starts a slow and steady change for you and baby girl makes her appearance before 40 weeks. Good luck! ‘Poopik is not amused.’ That cracked me up! You speak Poopik – and hopefully Baby quite soon! My pathetic Hebrew was missing the word for belly button, and it’s pronounced poopik? Amazing. I will be teaching that to the twins first thing tomorrow. The bump pics are great and I’m so glad you took them. I have so few (and none towards the end) and it bugs me sometimes. Good luck with the removal! 36 weeks!!!! So excited for you! And you look fantastic!!! It makes me so happy to see you with the baby bump! You are almost there. My baby was born at 36 weeks and was fully cooked and ready to leave the hospital on time… so I wouldn’t be too worried about going into labor at this point. I feel like I’m stalking your blog right now…so close! I got all excited here about the removal of the cerclage! Looking fabulously pregnant! I bet you’ll be glad to have those pics one day… even if it’s not til you’re in your 50’s. 😉 I’m surprised poopik hasn’t made her (?) debut already! Thinking of you as you prepare for stitch removal. Mo, I’m so excited for you and Poopik and B5 and Shmerson. SO EXCITED. You look fantastic!! Hope the cerclage removal was no big deal and that B5 makes her appearance pretty soon! you don’t have an outie yet? Jealous! Mine was out and proud by 15w and has never recovered!